I've been wanting to create a nice character from scratch for a while now, but I've been so busy with work that I haven't nailed down a design yet. So! 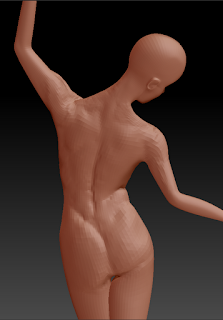 In the meantime, I'm using the female model I made to work on anatomy and get to play around more in ZBrush. It's been a while since I've used it, but once I started, I got back into the flow pretty quickly. I forgot how much fun ZBrush was!